Seven Card Stud poker is a poker game for 2 to 8 players using a standard deck of 52 cards. 7 Card Stud was a very popular game during the 1970s through to the late 1990s. It is not as popular as it used to be since Holdem appeared on the scene but it is a game still widely played at home games and has also now spread to online poker sites and back to live casinos. 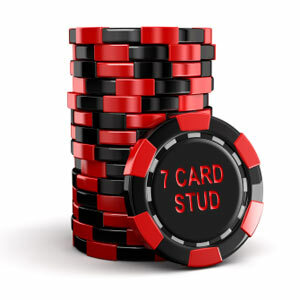 7 Card Stud can be played for a wide variety of stakes and is most commonly played with a Limit betting structure, in which the bets are in fixed increments. For example, in a $1/$2 limit game the bets are in increments of $1 on the first two betting rounds, and increments of $2 on the subsequent three betting rounds. So… How do you play 7 Card Stud Poker? Stud is played using Antes instead of blinds and there are no shared community cards like there are in Holdem Poker. During a hand each player will receive seven cards in total which can only be used by that player alone. From these seven cards they must make the best five card poker hand from the poker hand rankings to win the pot. 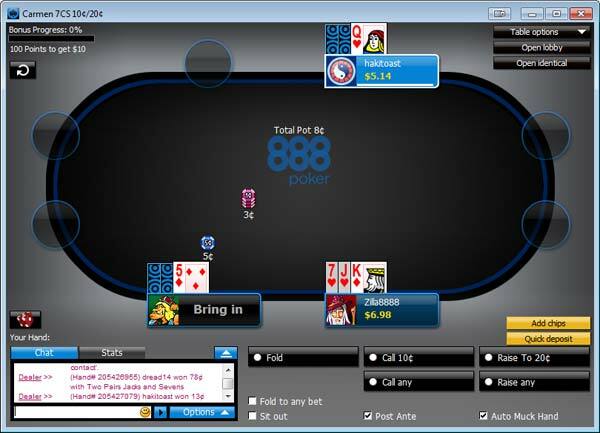 A player can also win the pot by being the last player left in the hand. This is achieved by placing a bet that no other player calls. Three of the cards will be dealt face down and can only be seen by that player (known as “down cards”) and four cards will be dealt face up for all players to see (known as “up cards”). Seven Card Stud has five betting rounds in total which is another difference to the four betting rounds you get in Holdem. In Seven Card Stud the dealer button determines who receives the first cards at the start of each hand. The player to the left of the dealer button is that player. Once the dealer button has been placed in front of the correct player then at the start of every hand all players at the table must put an Ante into the pot. The ante amount is normally 1/10th of the full bet for the table stakes you are at. So for example on a $5/$10 table the ante would normally be $1. This may vary slightly depending on the poker room you play at. Once all the Antes have been put into the pot each player is dealt three cards. One up card dealt face up for all players to see which is called the “Door” card. The player with the lowest exposed Door card will Bring In. This term is referring to a forced bet which that player has to make. The size of this bet is normally more than the ante but smaller than the Small Bet. For example on a $5/$10 table the bring in will be $2 (Ante $1, Small Bet $5, Large Bet $10). The Bring In player may choose whether to just place the bring in bet into the pot or alternatively they can make a raise to a full bet of the Small Bet amount. Then starting with the player to the left of the Bring In player and going in a clockwise rotation each player will be given a turn to act. Each player will have three options when it is their turn. Fold – which means to throw their cards away and take no further part in that hand. Call – which means to put in an equal amount of chips to the current bet (either the bring in amount or a raise). Raise – which means that the player will increase the current bet which then has to be matched by all other players if they want to continue in the hand. In the first round of betting all raises must be in increments of the low betting amount. So on a $5/$10 table each raise must be in increments of $5 and no more. There are only four raises permitted on each betting round. If this limit is reached all players must call the amount to continue in the hand with no further raises permitted. Once the first betting round has finished each player will receive one further card face up which is called the fourth street. The second round of betting will then start. The first player to act is determined by the player who has the highest value exposed cards of which there are currently two each. So for example if one player has A-A exposed this would be the most valuable compared to others like K-K or 9-5 etc. Check – which means they do not have to put any chips into the pot and are happy for the action to continue to the next player. If all players decide to check no one needs to put any chips into the pot and the hand moves onto the next stage. Bet – The second option is to bet. Again on this round all bets and raises must be in increments of the low betting amount. So on a $5/$10 table each bet or raise must be in increments of $5 and no more with a maximum of four raises per round. 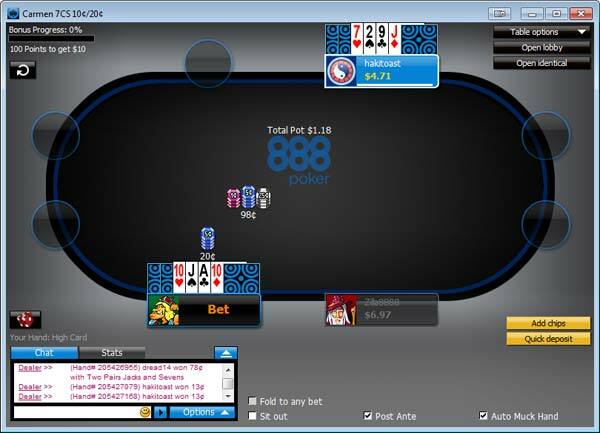 Once a player makes a bet, all remaining players will have the option to either fold, call or raise. Once all players have acted and have put an equal amount of chips into the pot the next stage comes about. A fifth card is dealt to each remaining player again face up and this card is called the fifth street. Another round of betting will start in the same way as the previous betting round. The only difference now is that for this round and all subsequent betting rounds the bets and raises must all be in increments of the high amount set on the table. So on a $5/$10 table all bet amounts will be in increments of $10 with a maximum of four raises per round. Once again the first player to act is determined by the value of all the players exposed cards – which each player now has three. Once the betting has finished after the fifth street another card is dealt face up to all remaining players which is called the sixth street. The last card called the seventh street is dealt to all players face down. At this point all players will know what their best five card hand is. All players will reveal the 3 cards which have not yet been exposed. The player who has the best five card hand wins the pot. In an event where there is a tie, the pot is split equally between these winning players. Seven Card Stud is not as popular online as it is as part of home games and not all online poker sites will offer Seven Card Stud as a game. If you want to try 7 Card Stud then you should head over to our Play Poker section where we can recommend to you an online poker site that is trusted and also offers 7 Card Stud. Practise is the best way to learn, so pick a low value stakes 7 Card Stud table and just experiment until you get used to all the stages above.